TechnoVilla Solutions Limited offers a complete portfolio of complementary service offerings designed to meet the diverse needs of our global client base. We are constantly adapting our skills and services to meet the changing pace of technology, ensuring we can continue to anticipate our clients' future needs. Web Server Administration: We can assist you with setting up websites, email hosting, domain management and more on your web server. We have experience with Windows Servers, and popular Linux control panels such as cPanel and Plesk. Webhosting and domain registration: We can help you find the best match of domain name to your company/business title and host it either in our server or any dedicated server with a very low cost. Domain Management: You want to setup a domain, point your site to another IP address, or add more domains to your account and you don’t know how? Contact us now for our support services and we can help! Email Setup: You have hosted email, but don’t know how to create a new email account, or set up email forwarding? You are receiving too much spam, but don’t know how to setup the spam filter? We can help. Web Site Migration: We have experienced staff on board that have migrated dozens of sites to different servers at different hosting companies. We have extensive knowledge troubleshooting the problems that can occur. We can take care of this hassle for you. 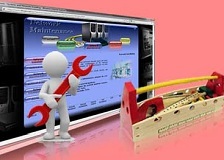 Desktop Application development support Let us know what you’re upto. We’ll be here available all day. Content Updates: No matter how small, you can depend on us to keep your site updated with the latest content as quickly as possible. Send us your content changes and they should be published within 24 hrs (depending on content). Banners / Pop-ups / Landing Pages: You have an ad or a promotion that you want to show on your site? Send us the creative files, and we can convert it into HTML and/or images and publish it to your site. We can also create flash animations if needed. Email blasts: You need help creating an email template for your campaign? We can help, send us the creative files, and we can create an email friendly template for you. Photo Galleries: We can create photo galleries for your website if you don't have one. Flash/jQuery/HTML5: Are you missing a flash/jQuery/HTML5 animation or image rotation? We can create one for your website. Search Engine Optimization: You want to update the keywords and tags for your site? Contact us for our Search Engine Optimization services. We can review your keywords and meta tags and work with you to update your site. Search Engine Marketing: Do you want to setup paid advertising or a pay per click campaign but don’t know how? We can assist you with setting everything up for you. CMS/Framework: Any problem in your system? Why don’t you contact us for best o/p.